MMA’s hottest free agent has finally found his way to the Octagon. 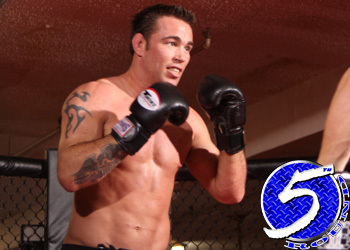 After years of posturing and months of negotiations, FORMER Strikeforce middleweight champ Jake Shields has just confirmed he will be taking his talents to South Beach … ahem, the UFC. “UFC contract officially signed. Fighting Kampmann in CA in a few months. Thanks to @danawhite and everyone for their support,” Shields Tweeted just moments ago. This pivotal match-up shouldn’t come as a complete surprise, as it was first reported by MMAFighting over the weekend. The only show the world’s premier mixed martial arts promotion has scheduled this fall in the Golden State is UFC 121 on October 23rd. That card features the highly anticipated heavyweight title scrap between champion Brock Lesnar and Cain Velasquez. In addition to vacating Strikeforce’s 185-pound crown, Shields also left behind the EliteXC welterweight belt when the company went belly up in 2008. His utter destruction of Dan Henderson this past April, parlayed with his 14-fight winning streak and ability to double-dip in divisions are the reasons he was the biggest free agent this side of LeBron James. Despite his lofty aspirations, Shields is expected to test the welterweight waters before attempting to enter Anderson Silva’s middleweight division. Kampmann owns an impressive 17-3 professional record and has quietly put together a solid resume. The Xtreme Couture trained slugger was last seen posting the biggest win of his career when he thoroughly manhandled Paulo Thiago for a unanimous decision victory at UFC 115.